Those who come to the United States looking for work compete with some groups of native-born workers but complement others. Since wages and the local poverty rate play a part in how many arrive, it is a challenge to quantify the effect they in turn have on both, and whether they push native workers below the poverty line. In a new study, Center for Poverty Research Faculty Affiliate Giovanni Peri finds that in 20 years, immigration has essentially no effect on poverty rates for U.S.-born families. In states and local areas with high rates of immigration, California for example, immigrant labor may actually have increased wages for low-skilled U.S.-born workers by two to three percent over the past decade. During the 2000s, U.S.-born workers without college degrees found higher wages in the 20 highest-immigration metropolitan areas because of large numbers of highly skilled and educated immigrant workers. During the 1990s, across states with high rates of immigration, immigrant workers increased poverty among U.S.-born families by 1% at most. In the 2000s, immigrant workers caused no poverty-rate increases in any U.S. state. The 1990s economy was radically different from that of the following decade, both in terms of prosperity but also immigration. It was a decade of growth and economic expansion. High numbers of immigrant workers had college degrees, but even more were at the other extreme with little or no education. The immigration rate for the more educated group was 4.3 percent, and for less educated was 7.1 percent. By contrast, the 2000s saw two major economic recessions. In that decade, immigration rates fell across the country, but nearly by half in high-immigration states like Nevada and Arizona. Nationwide, immigration rates for the most educated workers was 4.1 percent, only slightly lower than it had been the decade before. The immigration rate among less educated workers, however, plummeted to 2.4 percent, with an outflow of young workers who had not finished high school. This economic upheaval and its effect on immigration provided Center for Poverty Research faculty affiliate Giovanni Peri the opportunity to model the effects immigration has on native-born wages and poverty rates. This study finds that the increased demand for low-wage jobs created by highly educated immigrants more than offset competition from less educated immigrants. At the national, state, and local levels, immigration had essentially no effects on poverty over the twenty years analyzed, averaging small and positive effects in the 2000s and small and negative effects in the 1990s. To understand the effects immigration has on native poverty rates, this study builds on prior research about how the size of a particular labor group affects the productivity and wages of other groups, as well as how they complement each other in the production process. It incorporates these factors into the predominant economic model used to study immigration’s impact on wages, and combines them with detailed data from the 2000 and 2009 U.S. Census and American Communities Surveys on the number of immigrants at the national, state, and city levels by education, gender and age. The study then expands on the economic model by capturing how workers with different backgrounds in schooling, experience, national origins and skills complement each other in the larger labor market. The study also includes the potential for external factors that might affect productivity, such as the positive effect from the concentration of college graduates in cities. The major shift in composition among immigrant workers in the 2000s went beyond just a drop among the least educated. Among this group, the drop was particularly severe among young workers. Since immigrant workers compete for jobs primarily against natives with similar characteristics, such as education and age for example, groups facing the most competition should show larger increases in poverty rates. However, during the 2000s the most vulnerable groups of native-born workers experienced the largest increase in poverty rates but also received the fewest immigrants. Young women with less than a high school diploma are at the highest risk of poverty in the U.S., and should have benefited from the dip in competition. The native adult poverty rate increased from 12 percent in 2000 to 16 percent in 2009. However, among this group 34.5 percent were below the poverty line in 2000, and a stunning 42.4 percent were in poverty by 2009. On the other hand the “stronger” groups of more educated and older workers did not experience any increases in poverty rates, even though they experienced competition from relatively high immigration. During the 1990s, low-skilled immigrant workers potentially posed a larger threat to less-skilled native workers than they did in the 2000s. However, the study finds that during the 90s, low-skilled immigrant labor lowered the wages of only young, native-born workers without a high school diploma by two percent at most. In some models, wages among this group increased it slightly. For higher-educated groups of U.S. workers in the 1990s, there is even less evidence that immigration had a negative effect on wages. In states and regions with higher concentrations of immigrant workers, there is the potential for bigger effects on wages and poverty. On one hand, more immigrants with low levels of education may compete with natives for low-paying jobs. On the other hand, a larger inflow of highly educated immigrants creates more local demand and opportunities for low-paid workers. California is a case in point. During the 1990s, the state had an immigration rate of 12 percent across all education groups, which is roughly double the national rate. After 2000, however, the immigration rate in California fell to less than five percent, and became especially concentrated among workers with a college education. Among the least educated workers in California, during that decade, immigration may have actually increased native wages by two to three percent. In the 1990s, this study’s models estimates that immigration among the highest-immigration states increases poverty rates by at most one percent. In the 2000s, with an economy in recession, the study detected no increase in poverty or even a reduction of it, due to immigration in any state. Giovanni Peri is a Professor of Economics at UC Davis and a Research Associate of the National Bureau of Economic Research. His research focuses on the determinants of international migrations and their impact on labor markets, productivity, and investments. 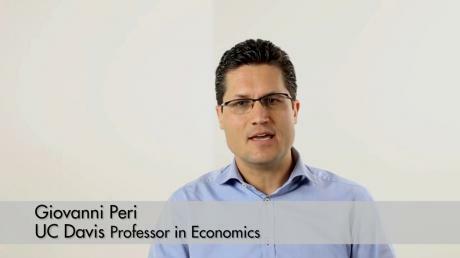 In this video, economist Giovanni Peri discusses how providing legal status could help lift immigrants in the U.S. out of poverty. This project analyzes the wage effects of immigrants on native U.S. workers at the national, state and city level, and quantifies the consequences of these wage effects on the poverty rates of native families.